Unfortunately, the dress you are looking for (Style: AL-60179, Name: AL-60179) is no longer available. This two-piece long diamond white prom dress has a look of fine china. Delicate embroidery in shades of blue contrast beautifully on the off-the-shoulder crop top with banded short sleeves. 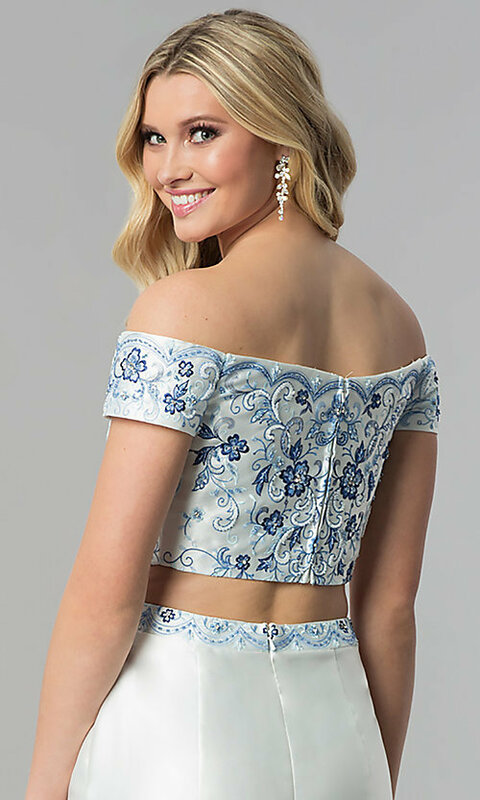 For a cohesive look, matching blue scalloped embroidery defines the natural waistline on the long white skirt that skims the hips before flaring away from the knees in mermaid fashion. Crafted from wrinkle-resistant mikado fabric, this exciting formal evening dress by Alyce will look as fresh at the end of the night as it does when you first checked your look in the mirror. It's hard to believe that for less than $200, this two-piece long white prom dress is a stand-out style for a prom event, military ball, or black-tie wedding reception. Beaded Details, Embroidered Top, Two-Piece, Short Sleeves, Please Note: The placement of the pattern on the dress may be different than picture due to cutting. Top 9" Bottom 46", Hollow to Hem 58"